Digital transformation is driving the increased deployment of cloud-based applications, a mobile workforce, and IoT. A new WAN architecture is required to support this digital transformation and deliver reliable, secure connectivity to people, places, and things. In a live webinar on May 24, 2017, Lee Doyle of Doyle Research and Todd Krautkremer of Cradlepoint will discuss the technologies enabling the next-generation WAN, including SD-WAN, Software-Defined Perimeter (SD-P), and LTE. Wireless LAN isn’t just for offices and coffee shops. Today, IoT is everywhere, making the mobility and flexibility of wireless crucial even across large, sprawling areas such as warehouses, mines, airports, manufacturing facilities, hospitals, and even entire cities. The need for large-scale wireless LAN is immense, but the ability of WiFi to meet that need is limited. Many organizations are instead deploying Private LTE, which can use a range of spectrums — including CBRS — to reduce congestion, enhance traffic flow, improve information security, and dramatically drive down costs. In a live webinar on April 24, Cradlepoint’s Roger Billings, chief architect, and Matt Thueson, solutions engineer, will explore the benefits of Private LTE vs. WiFi for wireless LAN, and the potential ramifications within various commercial and public sector use cases. Today, within agencies, many records management systems are moving to a digital format. With this fundamental change in information sharing and storing, agencies must follow proper cybersecurity governance and manage networking risks to protect sensitive information regarding operations, personal information, criminal records, and to keep records accurate for the purpose of developing cases. The Criminal Justice Information Services Division (CJIS) Security Policy was designed to ensure the protection of CJI, for this reason, agencies must be conformant with CJIS Security Policy within their agency operations. Attend this webinar to learn how agencies can leverage and manage secure, Gigabit LTE router solutions — while transferring and storing data digitally or utilizing the cloud— and comply with CJIS Security Policy guidelines. RSA was bigger than ever this year, with sessions ranging from data privacy to Python-based security automation. Cradlepoint Chief Security Officer Todd Kelly attended the conference and identified several key trends related to network security that affect how enterprises deploy branch, mobile and IoT networks. Join Todd Kelly and Mauricio Steffen, product manager for branch and security solutions at Cradlepoint, in this live webinar on March 28, 2019. They will share their takeaways from RSA 2019 and discuss how to incorporate what they learned into considerations for network architecture and vendor selection. Today, mission-critical connectivity is not just about getting MDTs hooked up to CAD systems. The connected vehicle is now the hub for law officers in the field to do their day-to-day tasks, protect citizens, and serve the community. Because of this, it is pushing more and more technology into the cruisers. In-vehicle wireless technology is becoming mainstream to effectively leverage modern public safety devices and applications and to take advantage of broadband networks dedicated to public safety. To maintain interoperability between technologies, it is imperative to choose the correct solution that keeps agencies CJIS conformant and offers the critical connectivity needed to not only serve the community but save lives in incident response. Join Michael Fletcher, business development manager and retired San Bernardino County Deputy Sheriff, and Estee Woods, director of public sector and public safety marketing, both of Cradlepoint, for this webinar for an overview of critical considerations for digital transformations happening in public safety, a solution comparison for in-vehicle and incident response networking solutions, and real-world uses cases. This webinar will help law enforcement understand the opportunities that come with wireless connectivity so they can be better prepared when emergencies strike. Utilizing dated technology is like having a pager in a smartphone world — and when lives are on the line, agencies need to understand those implications. and 5G are driving mission-critical LTE connectivity. compare for law enforcement applications. •How accessible in-vehicle wireless connectivity can be for agencies. Join Donna Johnson, vice president of product and solution marketing at Cradlepoint,, for a live webinar to explore the changing role of wireless WAN in the enterprise, as well as what Gigabit-Class LTE and 5G can do for the future of network connectivity. Agencies can achieve reliable networking through Cradlepoint’s cloud-delivered LTE wireless solutions, but there is still the important step of choosing an antenna option. Obtaining the optimal signal quality for mobile networks can be guaranteed by selecting the best-fit antenna. • MDTs inside the vehicle to file reports and access files without having to go back to headquarters. • WiFi for extended coverage range so vehicles can share connectivity. • GPS and CAD to send responders to the emergencies nearest to them. • Handheld devices or tablets used outside the vehicle to collect data at the scene of an emergency. Agencies need to know the right antenna to choose for different applications, or if they plan to use more than one carrier. In this live webinar Travis Culwell, business development manager at Panorama Antennas, will explain key details of antenna options as well as best fits depending on an agency’s needs; and Jason Johnston, enterprise support engineer at Cradlepoint and previous field technician for the City of Boise where he designed, deployed, and maintained an MDT solution for both police and fire, will highlight use cases of successful antenna installs. Most retailers are looking to improve and expand the services they can offer their customers, as well as ways they facilitate back-room operations and optimize their supply chain. Technologies such as cloud, LTE and 5G can enable and even drive those changes. Join Cradlepoint’s Todd Krautkremer, CMO, and Anthony Lawson, technical marketing engineer, for a live webinar to explore the different ways that retailers are leveraging 4G LTE and Gigabit-Class LTE wireless network solutions now — and preparing for 5G in the future. — LTE is being used today to transform in-store services, and how Gigabit-Class LTE changes what is possible. — IoT usage in stores is streamlining supply chains, reducing shrinkage, and improving employee productivity and safety. — Retailers that aren’t pinned down to fixed locations are expanding their reach and engaging with customers in new ways. — 5G is poised to drive even further change as retailers take advantage of the fastest speeds and lowest latency in the history of wireless networking. With the arrival of Gigabit-Class LTE network solutions for enterprises and public safety agencies, the era of wireless WAN is here — and enterprise networking will never be the same. Utilizing Elastic Wideband technology, Cradlepoint’s new cloud-managed routers featuring built-in Gigabit-Class LTE modems provide the speeds, reliability, and flexibility necessary to drastically improve existing use cases, and to enable new ones that have never been possible in branch or vehicle settings. With game-changing Gigabit-Class LTE, which leverages technologies that are foundational pieces of 5G, wireless now meets or exceeds other broadband networks, but with the added value of mobility, immediate deployment, and standardized billing on a single nationwide carrier. Join Donna Johnson, vice president of product and solution marketing at Cradlepoint, for a live webinar to explore how the world’s first Gigabit-Class LTE solutions for enterprise networking can revolutionize wireless WAN and put organizations on the Pathway to 5G. Join Lee Doyle, principal analyst at Doyle Research, and Donna Johnson, vice president of product and solution marketing at Cradlepoint, for a live webinar to explore the ramifications of cloud applications and IoT on branch architectures, as well as the role of flexible, cloud-managed edge solutions in meeting the diverse and ever-changing network requirements of today’s enterprises. As operators enhance existing networks with LAA, CBRS, and other current-day technologies, Gigabit LTE stands out as a key component in the monumental transition toward 5G. While there’s significant buzz about the ways in which 5G will transform business operations, the benefits of Gigabit LTE and enhancements to existing networks are being overlooked. It’s important for organizations to understand how Gigabit LTE and private LTE can help transform their operations now and help prepare them for 5G. Join Cradlepoint’s Lindsay Notwell, senior VP of 5G strategy and global carrier operations, and James Weaver, senior product marketing manager, for a live webinar to explore how Gigabit LTE’s speed and reliability are enhancing wireless networking use cases — and continuing the pathway to 5G. Public-safety organizations are not immune to the growing volume and variety of cyber attacks, as witnessed by the recent attacks on city governments and public-safety agencies, several of which took critical systems offline for days. According to Cisco’s 2018 Security Capabilities Benchmark report, 95 percent of attacks result in damages of $500,000 or more. As public safety organizations embrace the First Responder Network Authority (FirstNet) and connect more people, places and things, their “attack surface” grows exponentially, exacerbating the security challenge. FirstNet is bringing public safety a much needed mobile communications upgrade by introducing the latest private sector technologies into the public sector safely and securely. It helps to improve first responders’ efficiency, safety and response times by enabling better field and interagency coordination using new connected devices and applications. As many organizations begin to plan their FirstNet deployment, it’s a good time to re-evaluate network security strategy — from cruiser to cloud. This webinar will explore approaches and best practices in connecting and protecting the growing number of network endpoints that are part of modern policing, firefighting and emergency medical services, including PCs, tablets, vehicles, cameras, sensors, drones, robots, and live streaming video. It will highlight the inherent security features of FirstNet as well as define security functions required at the edge router to protect communications to back-office systems, state and federal crime databases, and the cloud. Additionally, the webinar will touch on federal security compliance requirements, which are now receiving greater scrutiny. To assure that the life-saving part of the Internet of Life Saving Things (IoLST) is always ready, communications with sensors and other devices needs to be always on and always available. We will the connectivity options—from private networks to cellular systems and satellite—and the various devices that are likely to be deployed in IoLST initiatives. In addition, we will explore the characteristics of components throughout the ecosystem, including tradeoffs associated with issues such as cybersecurity, long-lasting power and low-latency connectivity. The cloud has become indispensable to deploying and managing a network. Cloud capabilities and features are changing how IT teams operate, enabling them to save their organizations tremendous amounts of time and money while making processes much easier and efficient than ever. Cloud strategies in network architectures streamline the way IT professionals deploy, monitor, manage, secure, and troubleshoot wired and wireless WAN connections all over the world. Join Cradlepoint’s Mike Hagman, Senior Product Manager, and Anthony Lawson, Technical Marketing Engineer, to explore how cloud-related tools such as remote management, robust network analytics, scalable security applications, edge computing, SD-WAN and traffic automation, and many others are changing what’s possible in enterprise networking. Mike Hagman is an expert in defining, prioritizing, and communicating product roadmaps while leveraging input from market conditions, stakeholders, customers, engineers, and executives worldwide. He has a bachelor’s degree in computer information systems. Anthony Lawson is an experienced solutions engineer with an extensive background in the computer networking industry. He has strong experience in servers, data centers, Software-as-a-Service (SaaS), network design, and networking. He has a bachelor's degree in computer systems networking and telecommunications. The increasingly connected nature of branch locations is forcing IT departments to address significant networking challenges related to connection reliability, flexibility, management, security, and overall costs. Branch continuity is the ability to keep distributed locations up and running at all times — and it’s easier said than done. To maintain network access at the network’s edge , organizations need a flexible, cloud-managed approach that empowers lean IT teams to remotely monitor and manage the entire network without constantly sending staff or contractors to from site to site. Join Cradlepoint’s Donna Johnson, VP of Product and Solution Marketing, and Anthony Lawson, Technical Marketing Engineer, to explore how enterprises are updating their branch continuity architecture with cloud-managed 4G LTE, overlay failover, connection and router redundancy, and next-generation Out-of-Band Management (OOBM). Donna Johnson previously worked at Citrix, where she was the director of product marketing for its NetScaler SD-WAN solution. Prior to Citrix, Donna held senior product marketing and management roles at SD-WAN pioneer Talari. She also has held senior product marketing, product management, and engineering roles at Ahilia, Aligo, and Dorado Software. She has a bachelor's degree in electrical engineering. The modern first responder relies on always-on mobile networks to keep their mission-critical applications and devices up and running. These teams need technology to just work — anytime, anywhere — so they can focus on doing their jobs and trust that the technology will function. Soon, both agencies will take advantage of the U.S. government created First Responder Network Authority’s nationwide public safety broadband network. Other carriers have announced or are planning their own mobile public safety network using a dedicated cellular “core.” These networks provide a common ability to prioritize first responder communications and can preempt all other cellular traffic to deliver needed performance. Join Dale Rolfson, Battalion Chief, Indianapolis Fire Department, and Kevin Gona, Chief of Logistics, Indianapolis EMS for a live webinar to explore how Cradlepoint’s easy-to-use and best in class solutions are helping first responders to act and communicate faster. The widespread trends of IoT, technology-dependent field workforces, connected vehicles, and temporary retail sites are driving the need for pop-up and mobile network connectivity that is secure, easy to deploy, and can be monitored and managed from a central location. Scenarios including insurance companies during disaster response; short-term, seasonal businesses; construction offices; police and fleet vehicles, and one-time events all call for highly available WAN links, as well as remote visibility that doesn’t require on-site IT experts. Join Cradlepoint’s Ken Hosac, Vice President of IoT Strategy, for a live webinar to explore how enterprises are leveraging cloud-managed, 4G LTE network solutions to provide secure, always-on connectivity across an array of industries and use cases. Hosac has helped drive Cradlepoint’s growth and development through roles in strategic planning, product management, solution strategy and thought leadership. He frequently represents the company at industry conferences and events, and served on the original Advisory Board for the IoT/M2M Evolution Magazine. Hosac has 25 years of experience in marketing, sales, R&D and manufacturing. Prior to joining Cradlepoint, he served as VP of Marketing for Casabyte (later acquired by JDS Uniphase). He also served as VP of Business Development for GoAhead Software (later acquired by Oracle). Hosac earlier spent 10 years at Hewlett Packard with cable modems and head-ends, set-top boxes, and personal computers in a variety of engineering and engineering management roles. He holds a B.S. degree in Electrical Engineering and an M.S. degree in Manufacturing Engineering, both from Stanford University. With election polling places more dependent on technology and network connectivity than ever before, choosing a branch network solution requires careful consideration of factors including data security, connection flexibility, ease of use, remote management capabilities, and costs. With nearly $400 million in 2018 HAVA Election Security Fund now available, agencies have a prime opportunity to meet all of their networking needs and drastically improve their Election Day technology systems not just now, but for the future. Join Cradlepoint’s Bryan Wood and Edwin Mendoza for a live webinar to explore Cradlepoint’s comprehensive solution packages for secure, multi-WAN — including high-performance 4G LTE — and cloud-managed pop-up connectivity at polling locations. Consumers are no longer just observers in the world of signage; today they can engage in an enriched, interactive viewing experience. However, to become digital, applications need a secure, reliable network solution, providing faster ROI and added value. When digital signage is connected to the Internet, it’s possible for businesses to gain real-time intelligence and respond to information quickly. Wireless connectivity lets the network move fast to adjust messages as frequently as necessary. Businesses can also manage a single wireless network — with devices connecting across the world — from a single, remote location. Additionally, keeping digital signage on its own wireless network, physically separate from the main network, strengthens cybersecurity by shrinking a company’s attack surface. Digital signage can reach consumers in a way that print and static signage can only dream of, and the adoption of digital signage is only growing as cloud, mobile, and wearables become the norm. However, implementation of these applications will not be successful without a constant, secure network connection. Join Cradlepoint for a live webinar on July 24, 2018, at 9:00 am PT to learn about trends and advancements in digital signage and how reliable connectivity and cloud management impact and enable deployments. Michael Dickens is a Senior Solutions Engineer at Cradlepoint. Over his 8-year tenure at Cradlepoint, he has brought the company from a consumer based applications company to full robust enterprise solutions. In his previous careers, he worked on DoD networks, ISPs, data center management, and he attended Boise State University. Network security needs are changing right before our eyes. Digital transformation is shifting workloads to the cloud, increasing mobile workforces, and expanding IoT footprints — and network on-ramps. From branch locations to in-vehicle networks and IoT devices, cyberattacks become more advanced by the day. Today’s diverse network architectures and security needs make scalable solutions and flexible cyber threat intelligence essential. Many organizations want the cost savings and efficiencies of the cloud without having to sacrifice the level of security to which they’re accustomed. Join Cradlepoint's Ken Hosac, VP of IoT Strategy, for this live webinar to explore the blending of legacy and next-generation measures to keep enterprise networks secure. 5G isn’t just a trendy buzzword. For enterprises and organizations everywhere, 5G has vast potential to expand what’s possible — especially for IoT. With IoT deployments popping up everywhere and 5G rollouts right around the corner, organizations can take advantage of new opportunities ranging from very high-density IoT to augmented reality and real-time video to provide new services and gain competitive advantages. Many use cases that already are thriving with 4G LTE are poised for even greater performance, reliability, and cost-efficiency once 5G arrives. Join Cradlepoint’s Roger Billings, Global Solutions Architect, for a live webinar on June 7, 2018, at 9 am PT. You’ll explore the opportunities, challenges, and solutions surrounding 5G and IoT connectivity, security, and management. 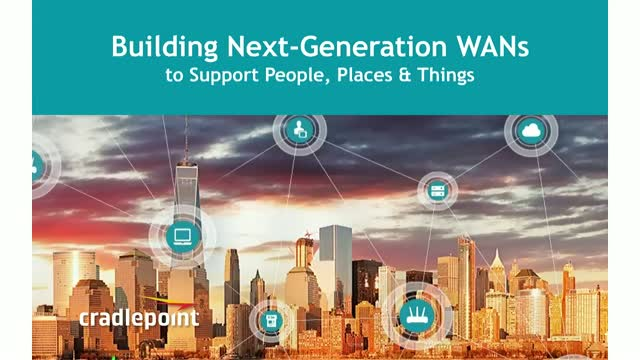 Enabling the Elastic Edge for Connecting People, Places & Things. Cradlepoint is the leading provider of cloud-based wired and wireless WAN networking solutions for Distributed and Mobile Enterprises. Cradlepoint solutions provide the strongest wireless and broadband performance while delivering proven network system interoperability. Cradlepoint’s broad family of high-performance router platforms are designed for deployment in mission-critical applications that require 24x7 connectivity. With both integrated wireless and wired WAN and non-integrated versions, our solutions are ideal for distributed and mobile operations and emerging industries that require either remote connectivity or multi-WAN redundancy. Cradlepoint’s NetCloud platform enables enterprise network administrators to easily create, monitor, manage, and maintain their distributed network running on different WAN sources from a single location. Founded in 2006, Cradlepoint has shipped over 1.4 million routing platforms and offers solutions certified and promoted by major worldwide carriers. Cradlepoint is a privately held company with headquarters in Boise, Idaho.